Below is the quarterly edition of the Zappos Vendor Newsletter! This edition focuses on Carton Labels, Mis-ships, and Vendor Relations. Please forward this newsletter to the appropriate support teams in your organization. 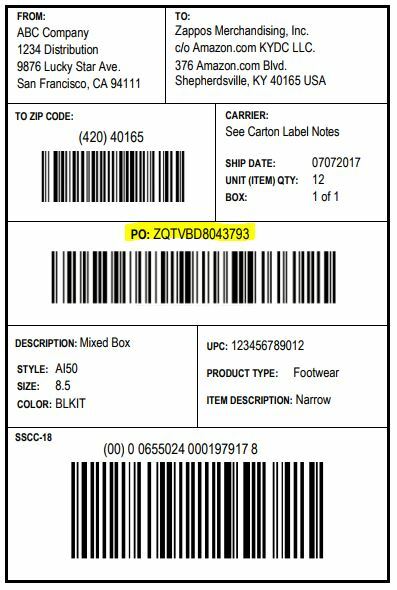 Zappos has updated our GS1-128 Label requirements removing the '400' Application Identifier from the Purchase Order (PO) number and barcode in Zone E. The Application Identifier is a prefix code used in order to attribute meaning to data encoded within the barcode symbology. This Application Identifier should not be present when scanning the PO barcode. If correctly entered the barcode scan should read EXNULAO1234567. An example of an incorrect scan would be 400EXNULAO1234567 or (400)EXNULAO1234567. If the 400 Application Identifier is present in the scan, the product will be sidelined and identified as incorrect barcodes or an invalid Purchase Order number. This product must be manually received causing delays in accepting product into our fulfillment centers. Please note this change does not apply to the Zip Code and SSCC-18 codes. Please review your current GS1-128 label for accuracy and make any necessary changes to adhere to our guidelines. We greatly appreciate your help to resolve this issue and we encourage suppliers to send any labels they would like verified to edi@zappos.com. Below is a link to our sample label for your reference. Please note: Communicating PO changes via the EDI-856 (ASN Advanced Ship Notice) will not be accepted; they must be communicated via the EDI-855 before the PO is shipped. Shipped products that were never ordered are subject to being returned at the vendor's expense or may result in disposal. This includes products ordered on the PO but we received additional units (overage). This also includes additional units sent with a PO but were not ordered on the PO. In the case of disposal or liquidation, Zappos will not pay vendors. Each quarter, our buyers can nominate one of their sales reps that really WOWs them for the Vendor of the Quarter award. It’s a great way for Zappos/6pm buyers to recognize awesome reps that go above and beyond to help out our business. All Vendor of the Quarter recipients are also eligible to be recognized as our Vendor of the Year, awarded at our annual Zappos Vendor Party in August. Here is what one of our buyers had to say about their amazing Vendor of the Quarter. How does your vendor WOW you? Amanda always goes above and beyond to get us the best product at the best pricing. Because of her, we have been able to create so many new styles which has really driven our business this past year. How they treat the business: She treats the business like her baby. She is always so fast and responsive and isn't afraid to push us a little bit if its something she feels will drive our business. POs are always written incredibly fast and she is on top of everything! How does your vendor stand out? There has been a lot going on this year with this brand and she has handled it all so well and used it to our advantage. In Q3, Zappos decided to walk away from the brand giving 6pm the opportunity to buy more and make up for those missed sales. Amanda took this news and used it to get us even more product and drive more profit to the total company! Tell me more! Amanda is pregnant and will be out on maternity leave after Feb. She is an amazing rep and I really hope she can be recognized this year before she leaves. Congratulations Amanda and thanks for being an amazing Vendor!